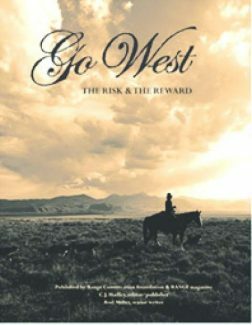 Go West: The risk and the reward by Rod Miller, published by C.J. Hadley, Range Magazine editor. Italian cowboys from the Maremma region, the butteri, were featured during the 29th National Cowboy Poetry Gathering (NCPG) in Elko, NV. Butteri, plural, comes from the Latin phrase for "leader of oxen." A cultural display at the Western Folklife Center spotlighted the cowpunchers from the region along the Mediterranean Sea, from southwestern Tuscany to northern Lazio, who are among the world's earliest cowboys. Several participants were fluent in English, while others spoke through interpreters. Two communicated with their traditional instruments: guitar, accordion, and Sicilian bagpipes. One prepared peasant food eaten by the locals, which is now popular in chic cafés. Besides workshops, day sessions, tours, and concerts, the NCPG is a time to catch up with old friends and make new ones. With two bookstores operating during, and autograph sessions at both, it's also a grand opportunity to see current cowboy and Western Americana releases. 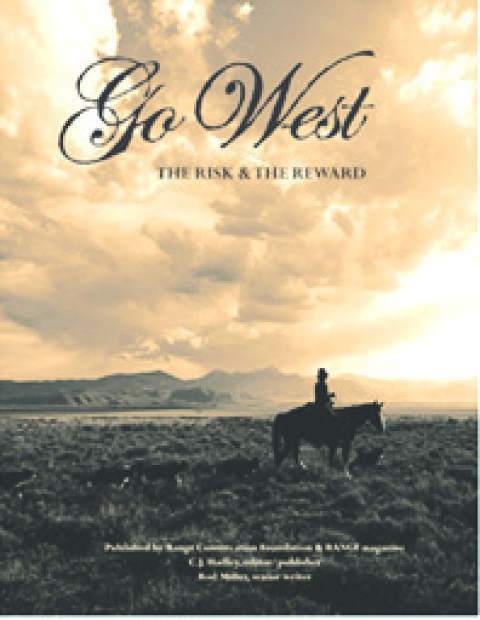 One of the books honored with a signing was Go West: The Risk & The Reward, C.J. Hadley, editor/publisher; Rod Miller, senior writer (Range Conservation Foundation & RANGE Magazine, 2012, 9"x11", 128 pages, photos & illustrations, hardback, ISBN-13: 978-0964745605). C.J. Hadley, the editor of RANGE Magazine, and Rod Miller, award-winning poet, historian, biographer, journalist, and essayist, are familiar faces at the gathering. It was good to see them taking their turn at the autograph table. In visiting with Rod, I confessed that I hadn't yet read the book. Too bad. I could have told him in person what a masterful job he did of writing the sparse-but-effective copy for the coffee-table book. Having since returned from the gathering, I found time to read the text and savor the photos devoted to the region he pinpoints as "west of the 100th meridian and east of the Sierra Nevada and Cascade Mountain ranges." Rod's knowledge of, and affection for, the topic is evident. So too, is his implementation of the "less is more" narrative. Kudos, Rod, for making the history of settling the West as inclusive and effortless to follow as you did. 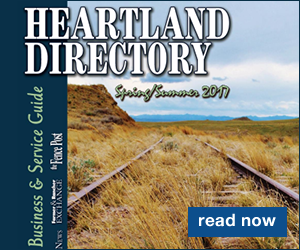 From Indian nations to prospectors, building the transcontinental railroad to the Homestead Act, it's there. Also documented are the hazards of westward travel on the Oregon and California Trails: cholera, accidents, starvation. Rewards envisioned at the end of the westward trails were as varied as those who traveled them. Thousands died. Those who succeeded in reaching their destinations were determined and resourceful. Only about half of the homesteaders who filed ultimately received title to their claims. As Rod notes, "Now, as then, community, companionship, and camaraderie coexist comfortably with fierce self-reliance, independence, and individuality." "Now" is portrayed in images taken by photographers who ventured off the main thoroughfares into a semi-arid land dotted with cattle, sheep, horses, wildlife, and the occasional human. Tenacious and hopeful, they inhabit the plains, mountains, and deserts, daring to call them home. As Rod notes, Wallace Stegner once wrote, "One cannot be pessimistic about the West. This is the native home of hope." Purchase Go West from RANGE Magazine for $25 at 1-800-726-4348; RANGE Magazine, PO Box 639, Carson City, NV 89702-0639; http://www.rangemagazine.com. 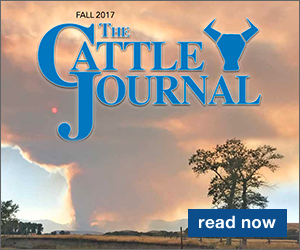 Subscribers to RANGE Magazine receive a $5 discount. Deanna Dickinson McCall could have been pictured in Go West. A fifth-generation rancher, she spent more than two decades raising her family on a remote Nevada ranch without phones or electricity. Currently, she and her husband and son ranch in the Sacramento Mountains of southern New Mexico. 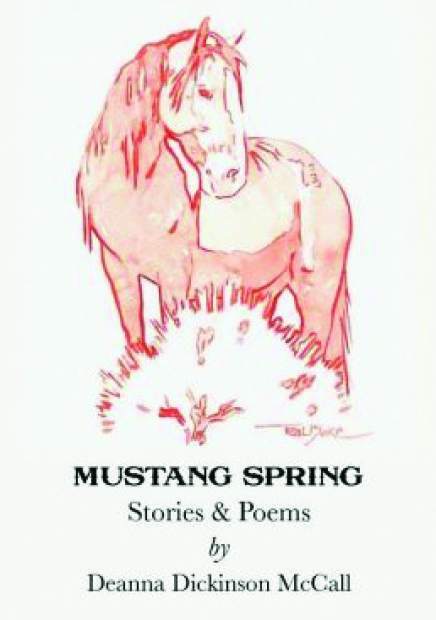 She dedicates a new collection of short stories and poetry to them entitled Mustang Spring: Stories & Poems (The Frontier Project Inc., 2012, 154 pages, softcover, ISBN-13: 9780985342531). Writing from the viewpoint of a daughter, a hand, a wife, and a mother, Deanna speaks my language. I'm not a big fan of western fiction, largely because I hold authors to a tough standard for authenticity. With Deanna, I visualized the scenes as I read and they rang true: a horse dropping out from under a rider in a blizzard; the bright-eyed little queen candidate and her shabby horse; a young ranch wife going about her chores with a baby asleep in the pickup. Deanna has been featured at the NCPG and other events throughout the West. Her CD, Riding, was selected as 2012 Poetry Album of the Year by the Academy of Western Artists. For more, see http://www.cowboypoetry.com/deannamccall.htm, where you'll find a sampling of her poetry, including these from the book: "Old Corrals"; "Cow Country Code"; and "The Hired Hand."